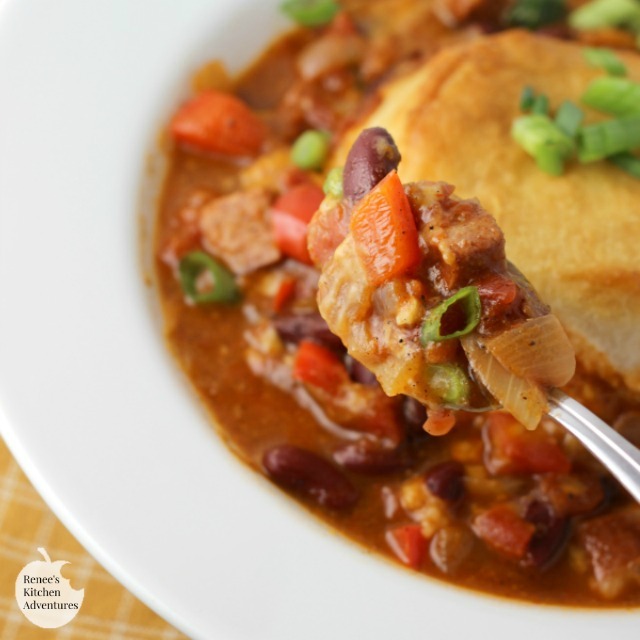 Skillet Cheesy Sausage Chili Pie turns an average chili recipe into something extraordinary by swapping ground beef for Hillshire Farm® Polska Kielbasa and turning it into a skillet pie with an easy, cheesy biscuit topping all in a one-skillet meal! 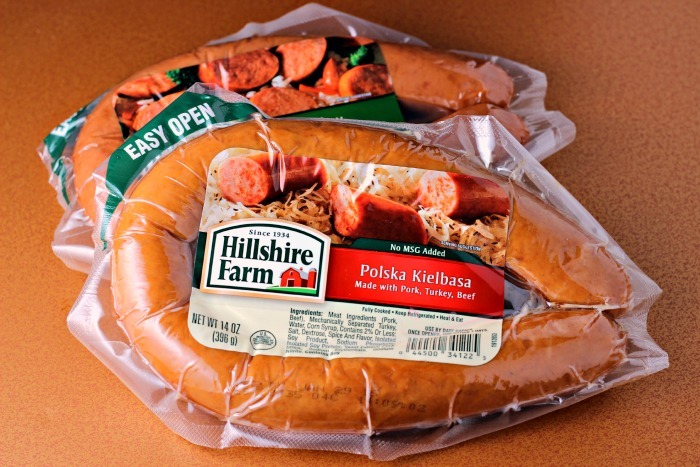 Hillshire Farm® Polska Kielbasa is a regular item on my shopping list. I love the flavor and convenience. I also love that it is made with premium cuts of meat that are perfectly seasoned. It makes getting dinner on the table so easy! I've served this rope sausage in all sorts of ways over the years, but swapping it for the ground beef in my Skillet Cheesy Chili Pie was pure genius! My husband was delightfully surprised when I served this dish last week. Fully expecting to bite into ground beef chunks, what he got instead, was flavorful bites of sausage...and that made him very happy! Happy enough to have two servings and request I pack up leftovers for his lunch the next day. I have to admit, I loved this sausage in this recipe as well. We both liked it so much it is destined to become a regular on dinner rotation in this house! This recipe could not be any easier to throw together on a busy weeknight! 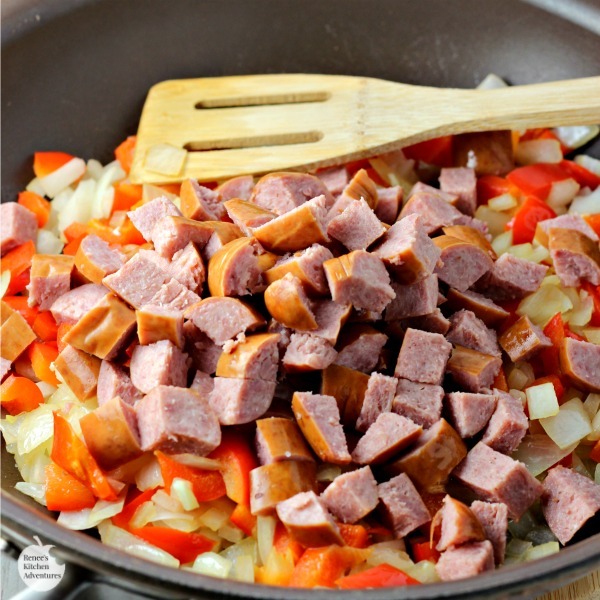 It's made all in one large skillet and, because the Hillshire Farm® Polska Kielbasa is fully cooked, comes together in about 30 minutes! Make sure you use a big skillet (at least 12") and one that is oven safe too. 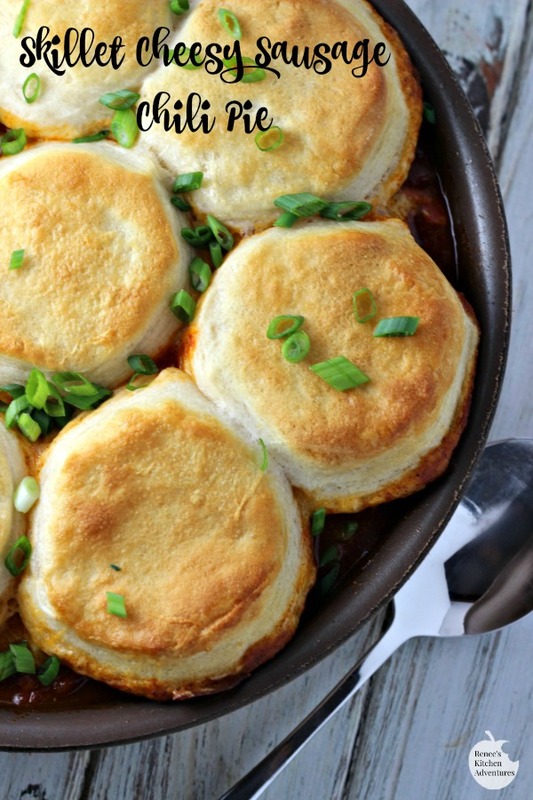 You'll need to pop the skillet into the oven for a few minutes to bake up the biscuit topping. Let's get cooking! 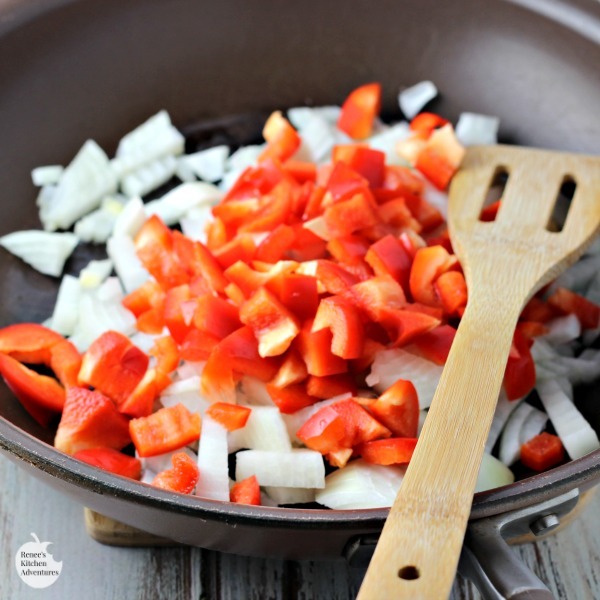 Start by sauteing up some diced onion and red pepper in a little olive oil until it begins to soften and become translucent. Next add some minced garlic and diced Hillshire Farm® Polska Kielbasa and continue cooking until the sausage starts to brown. Add the cumin and chili powder and stir and cook a few minutes to release the flavors. Next stir in the beans, tomatoes with juice, and a can of tomato sauce. Stir well and top with shredded Mexican blend cheese. Place large refrigerator dough biscuits on top of the cheese and bake until the biscuits are golden brown. Top with some diced green onion for color and enjoy! 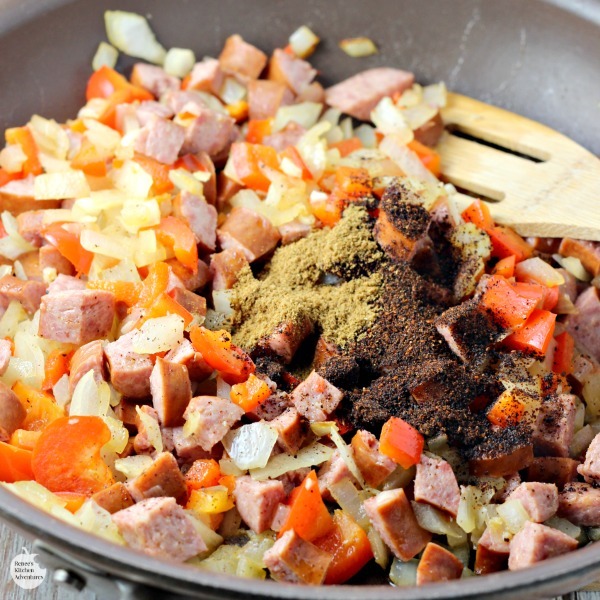 What family favorite recipe would you mix up with Hillshire Farm® Polska Kielbasa? 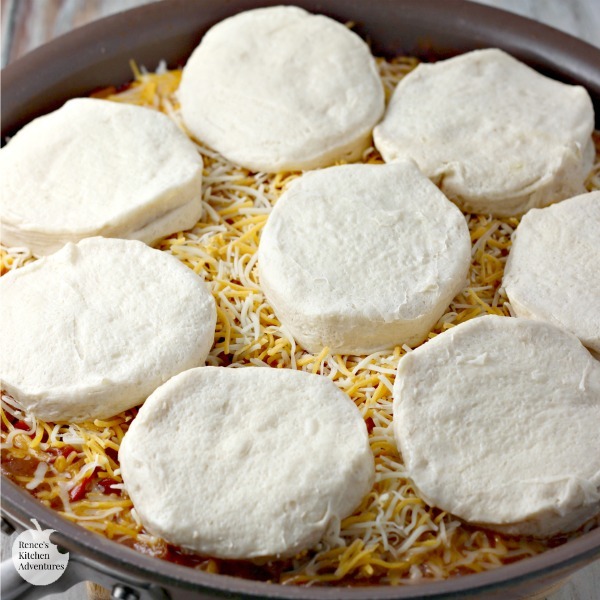 An easy one skillet chili pie made with Hillshire Farm® Polska Kielbasa and topped with cheese and golden brown biscuits! Heat oil in large oven proof skillet over med-high heat. Add onion and pepper and cook until they begin to become softened and translucent (about 6 minutes). Add in the cumin, chili powder and black pepper and stir. Cook for about 1 minute. 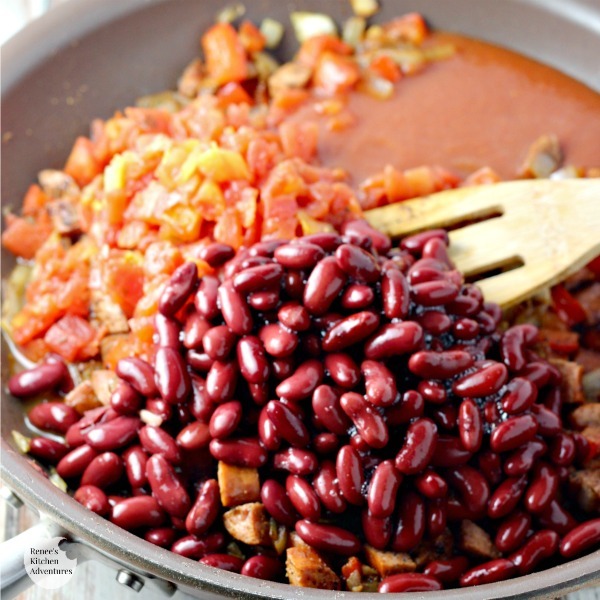 Stir in bean, tomatoes in juice, and tomato sauce. Heat for about 1 more minute then take off heat. Sprinkle top with cheese, then top with biscuits. Place skillet in preheated oven and bake until biscuits are golden brown, about 13 to 15 minutes. Garnish with chopped green onion. 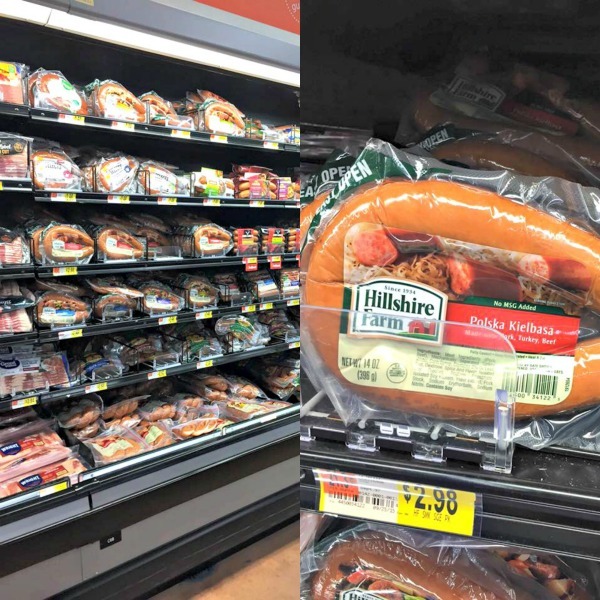 I found Hillshire Farm® Polska Kielbasa and everything I needed to cook up this quick and easy dinner at my local Walmart! 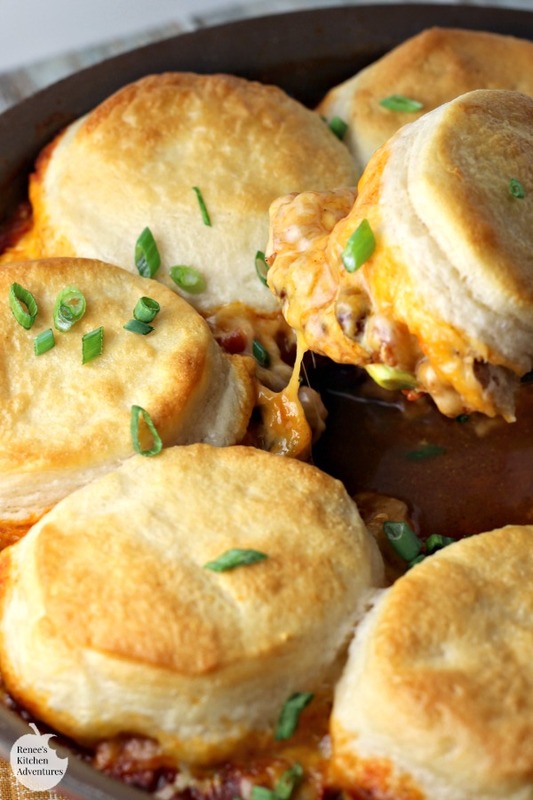 Chili with biscuits on top - what a fantastic idea! This chili looks amazing. I LOVE Hillshire Farm kielbasa, I bet that flavor is just awesome in this dish. I just love this dinner idea! I am a huge fan of Hillshire Farms turkey sausage, so I would totally make this using it. :) Looks delicious! I love skillet meals. This one with the combination of kielbasa and biscuits sounds divine. This looks like a delicious skillet dinner. My husband and I would devour the entire skillet full of this! The ingredients are wonderful, Renee! Pinning NOW!